Remember the good times with a city banner. There are likely a lot of things about 2008 you're going to want to forget (like the current state of your 401K, for starters), but chances are, there are a few things you'll want to remember (hey, the Cubs and Sox didn't make it to the World Series, but they DID clinch the NL Central and AL Central, respectively – not too shabby). 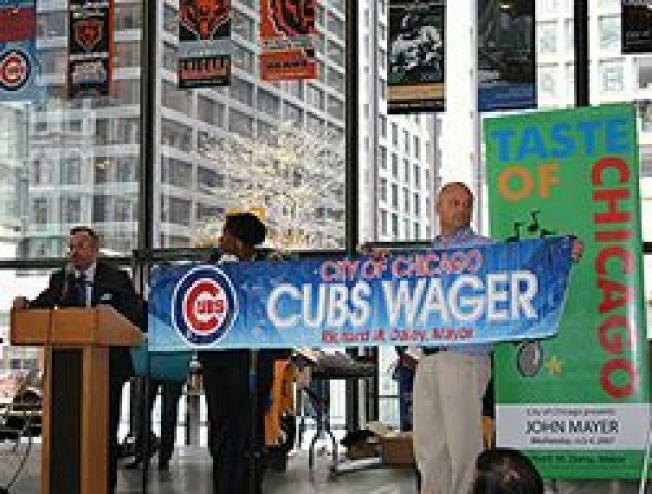 For a unique holiday gift for the ultimate baseball fan, swing by the Daley Center (50 W. Washington St.) at noon today (Wednesday, Nov. 19) to bid on a city street pole banner. Banners from city festivals and museum shows will also be up for auction. Proceeds from the sales benefit Mayor Daley's "Sharing It" Program. Donations are made to the Chicago Anti-Hunger Federation and the Greater Chicago Food Depository and to purchase holiday gifts and provide holiday entertainment for underprivileged Chicago children. If you can't make it to the Daley Center this afternoon, you'll get another chance at the auction at Harry Caray's Restaurant (33 W. Kinzie St.) on Saturday, Nov. 22 from 11 a.m. to 1 p.m. Admission is free to both auctions.